Vice President Dr Mahamudu Bawumia has called for fair and equitable sharing arrangement of West African countries natural resources in order to propel their development efforts. He expressed worry over revenue leakages through improper accounting of extractive resources by Multinational companies operating in the sub-region and locking out resource-rich countries from the 'high value ends of the value chain'. He said the 'Africa beyond Aid' agenda was supposed to focus on trade and investment with fair sharing of the value of its natural resources hinged on 'Value-Added Resource-for-Infrastructure' deals. Vice President Bawumia said this at the opening of the Regional Conference on Fiscal Management of Mining and Petroleum Resources in West Africa, in Accra, on Tuesday. The four-day conference is being organised by the Africa and Fiscal Affairs Departments of the International Monetary Fund (IMF), which brought together government delegations from Ghana, Nigeria, Senegal, Sierra Leone, Niger, Mali and Mauritania, to discuss challenges facing the resource-rich countries in the sub-region. Some personalities attending the conference include; Carla Grasso, Deputy Managing Director of the IMF and Natalia Koliadina, the IMF Resident Representative. Topics expected to be discussed at the conference include; Impact of commodity prices on resource-rich countries in West Africa, Fiscal impact of 'Lower for Longer' petroleum prices and investment outlook in established and prospective petroleum producers, Fiscal performance and investment outlook for mineral producers, as well as fiscal regimes for extractive industries in West Africa and Petroleum fiscal reforms in Nigeria- rebalancing the government take and encouraging cost reduction. 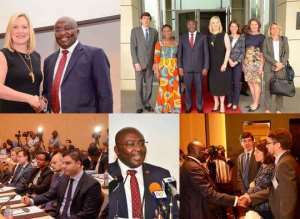 Vice President Bawumia urged participants to discuss issues militating against resource-rich countries, including revenue leakages through improper accounting for resources extracted, locking out of resource-rich countries from the high value ends of value chains, limited local content and the lack of full participation of local businesses in resource industries. 'There is the need to stem the abuse of the channels, which essentially saddle resource-rich countries with a large part of the costs of exploration. 'The revenue envelope for African countries can be greatly enhanced, given competent management and fiscal discipline, will create the space needed, in order to borrow less to finance our budgets,' he emphasised. Vice President Bawumia asked African governments to plug revenue leakages, which occur through improper accounting of natural resources taken from the Continent and scaling up participation of the indigenous businesses in the high-value ends of the natural resource value chain. 'Ensuring full participation of indigenous businesses in resource industries, not just providing 'content', but working together to stem the illicit financial flows that takes place daily in the sector,' he said. Vice President Bawumia noted that, growing revelation of illicit financial flows through 'external accounts' and 'mispricing of trade transactions', deprived ordinary citizens of the full benefits of their natural resources. 'We are blessed with vast natural resources, for many countries, these hidden resources have turned into a 'resource curse. 'While natural resources are intended to generate revenues for development, in many places, they have led paradoxically to political instability and economic stagnation. He cited some countries in the sub-Sahara Africa, including Democratic Republic of Congo, Sierra Leone and South Sudan, which natural resources exploitation had brought violence, wars and other forms of conflicts. Vice President Bawumia urged African countries to add value to their natural resources, to maximize profits, instead of exporting them raw. 'We're currently championing such arrangements by trying to develop our infrastructure on the back of an Integrated Aluminium Industry using our bauxite deposits,' he stated.